As we approach the holiday season, presents are not the only thing that will be “wrapped up” this month. In each grade level, we are finishing the first semester science and engineering units. Throughout the month of December and early January the students will explore coding using the Hour of Code and participate in a few technology lessons during STEM class. In the new year, the grade levels will move into their second unit of study for STEM that will take them through the remainder of the year. Sixth Grade: These engineers are almost finished building and improving their acoustical instruments. My goal is to have the students record a short video explaining their instrument’s design and demonstrating the instrument. Unfortunately, we will not have time to play a song together as a class for a school/grade level competition. In January, the sixth grade classes will be moving into the study of chemistry, focusing on mixtures and solutions. Fifth Grade: Using controlled experiments, these scientists are investigating and exploring speed, momentum, and collisions using steel balls, ramps, and foam runways. This cycle the students will create their own experiment to identify new scientific knowledge, building on what we have already discovered through our previous explorations. 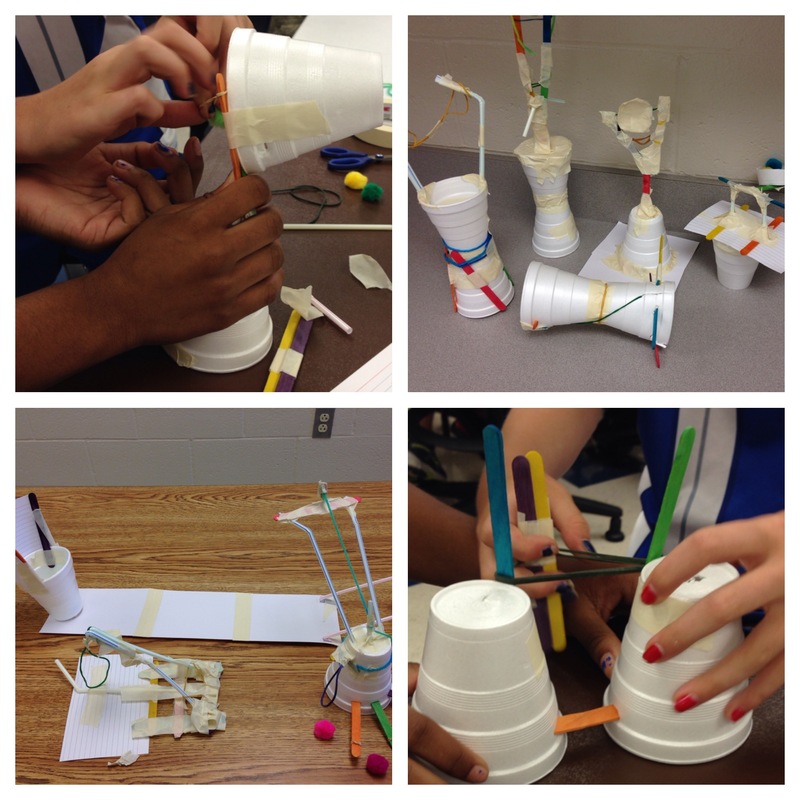 Fifth grade’s next unit will focus on engineering – the students will be designing windmills. Fourth Grade: This cycle the students are wrapping up their exploration of series and parallel circuits. Each group must decide which circuit is best for a string of lights, Christmas lights to be exact! Working in collaborative groups, the students are building the circuits, testing the simulation of a burned-out bulb, and writing a recommendation letter to the board of the company. We will continue with energy in January; the students will be engineering a solar oven! Third Grade: Our third grade scientists recently planned their own experiment to determine what happens when solids and liquids are mixed together. This cycle the students will test their ideas, using their own procedure and chart to record observations. After the holiday break, third grade will focus on ecological behaviors and systems. Second Grade: These geologists had a blast learning about Earth’s materials. We finished up the unit with the students sorting a rock mixture into the following groups: large pebbles, small pebbles, large gravel, small gravel, and sand. Once we have finished our technology lessons, these second graders will begin exploring balance and motion. First Grade: The students recently investigated toothpaste, in order to decide if toothpaste was a solid or a liquid. These scientists have learned about the properties of solids and liquids throughout many investigations. After the holiday break, the first grade classes will begin studying insects and plants. Kindergarten: Our youngest scientists recently switched gears from the study of trees to the study of weather. This cycle the students are making their own wind sock, to observe wind direction. In January, we will begin learning about living things. There will be a few aquariums and terrariums in our classroom for the students to explore! MDS: Our little beans sprouted! It was exciting to see the beginning of a plant’s life cycle. In STEM class, we began our discovery of weather a few weeks ago. Using water, shaving cream and food coloring, the students were able to see clouds rain! Before the holiday break, the students will be exploring temperature and the four seasons. My maternity leave will begin on Monday, December 14th. This is a very exciting time for my family! I will miss the students at Blue Ball Elementary, but know that my time at home will be precious and memorable. My plan is to return on March 7th, 2016. Enjoy your holiday – Merry Christmas and see you in the new year! Can you believe it is already November? The holidays are just around the corner! Over the past few weeks, the students have continued to dig deeper into their grade level’s first semester STEM unit. Lots of noise and excitement can be heard outside of our room as the students explore, discover, and design! Here is a quick update about where each grade level has been and where we are headed leading into the holidays. Sixth Grade: These engineers are now hard at work brainstorming and planning their group instrument for our Rising Star Competition. As mentioned in the previous post, each class will be designing six innovative instruments. Together, they will play along to a song and audition for the competition (against the other sixth grade classes). In the next few weeks, your child may be asking for help or a few materials. We should be ready to record the audition videos by the beginning of December. Contact me if you have any questions. Fifth Grade: By working through a controlled experiment, the students have identified the variables that impact how many cycles a pendulum makes during a unit of time. Currently, we are experimenting with the speed of various size steel balls using a ramp/runway system. The students have tested the variables of size and release position to learn about kinetic and potential energy. Fifth graders will be applying this knowledge when we explore collisions, energy transfer and momentum. Fourth Grade: Over the past few weeks, the students have enjoyed investigating a variety of systems: tone generators, hand-crank generator, motors with solar cells, rubber band banjos, and much more. Through their investigations the students learned about how energy is transferred, how to identify the energy source, and what observations can be made to show evidence of energy. In the next few weeks, the students will be creating and exploring series and parallel circuits. Third Grade: Continuing with our study of measurement and matter, the students used a balance and gram mass pieces to make accurate measurements of small objects. After learning how to measure volume and mass, the students are beginning to apply this knowledge to different collaborative investigations. This week all third graders will determine how to test and prove whether or not a dry sponge can soak up more than its own mass in water. Second Grade: These geologists absolutely love learning about rocks and Earth’s materials. We recently investigated whether or not there was an Earth material smaller than sand. And after a week of waiting, the students discovered SILT. They were super excited! This week the second graders are exploring clay. Could it be possible to have an Earth material even smaller than silt? First Grade: Our explorations have led to the understanding of solids and liquids, focusing on how we can describe them by their properties. Now, the students are applying their knowledge of properties through challenging investigations and engineering tasks. This week the students need to construct a bridge using only one piece of paper to support a plastic 1/4 L container of pennies. The design that holds the most pennies wins! Kindergarten: Recently, we went on a leaf hunt and observed the seeds of fruits. The students are learning how to compare and use their comparisons to learn about trees and plants. These scientists are becoming experts on trees and are getting ready to begin investigating weather. MDS: We are learning about trees and plants. The students have used their senses and matching skills to learn about leaves and their shapes. Now, we are focusing on the plant life cycle. Each student created a “Little Sprout House” to watch how a seed sprouts. Hopefully, we will see something new in our “houses” after the weekend! We have spent a few weeks identifying the properties of sound through exploration and the engineering process. At this point, I am introducing to each class their sound engineering challenge. Each class will be responsible for designing and creating 5-6 instruments over the course of the next few weeks. The instruments will be created out of everyday materials, and they will be used to form a band, playing along to a song of my choice and/or class choice. My goal is to have the students ready to “audition” for the band competition by late November – early December. Each class band will be competing with each other for the Rising Star Competition. This specific performance task was found on Defined STEM, a collection of performance tasks and resources to be used in classrooms. Below you will find a document titled, Rising Star Competition, that explains that task in more detail. Your child should be bringing this paper home with them this week. As we begin our design process, your child may start asking for a few things to borrow from home. We are looking for common household items that are safe and inexpensive. He/She may want to bring some household materials to school. Please know that if your child brings materials from home, they will not be returned, so please don’t let them bring something to school to use as part of their instrument if you want it back. I’m super excited to see what the students design as they prepare to enter our musical group competition! The 6th graders have shown creativity and innovation over the last few weeks – this should be a fun challenge for the students. If you have any questions, please email me at amber_mccabe@elanco.org. Now that we are a few weeks into each grade level’s science and engineering units, it is time for an update! Each grade level has an area of focus for semester one, using exploration and project-based learning to teach the required state standards. Sixth Grade – Our focus is on acoustical engineering. We used the engineering process to brainstorm and plan a design to allow us to “see” sound vibrations. Currently, we are investigating two different instruments – the guitar and the horn. Using a variety of materials, the students are identifying how to dampen the sounds/vibrations on each instrument. Fifth Grade – To investigate forces and motion, the students created and tested pendulums. Following a controlled experiment, our fifth graders identified how the variables of mass, release position, and length impact the number of cycles a pendulum makes in a unit of time. Fourth Grade – Circuits! Circuits! Circuits! We began by exploring how to light a bulb using wires and a battery. The students enjoyed this investigation and learned how electric current flows through a circuit. This week we changed the energy source, heading outside to use solar cells to power a motor! Third Grade – Our investigations began with identifying the need for standard units of measurement in science and everyday life. We practiced using the meter and centimeters to accurately measure a variety of lengths and distances. Currently the third grade scientists are using syringes, graduated cylinders and beakers to measure volume and capacity. Hopefully, the students don’t get too wet as we explore volume! Second Grade – As we study Earth’s materials, the students have become geologists in my classroom. We identified the properties of rocks by exploring what happens when rocks are rubbed together and placed in water. This week the students will be using screens to separate a river rock mixture. And of course, going on their field trip to Crystal Cave! Kindergarten – Autumn leaves are falling down! These young scientists are using their observation skills to describe trees and leaves by their properties. Looking forward to the next few weeks! As your children work in the STEM classroom, the majority of the hands-on learning experiences will be completed collaboratively with their peers. All students have been assigned to a table group of four individuals. This is the group that your child will be working with for the year. There is a point system in place that gives each class the opportunity to choose partners/group for an activity, after five points have been earned. In order to practice working together, each grade level participated in a STEM collaborative challenge! The challenge was not linked to the upcoming units of study, but instead was a fun activity to teach/review and practice the expectations of working together. Kindergarten – Our focus in Kindergarten was to practice using our five senses to observe different objects and to determine what they could be. Students worked in groups to discuss their thoughts and describe objects using their senses, including yummy popcorn! 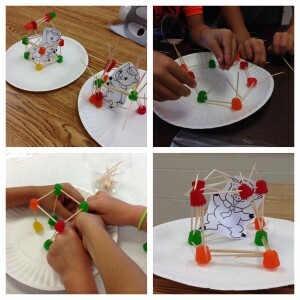 Grades 1 – 2 were engineers for the day! After reading the beginning of The Three Little Pigs, the students were asked to construct a house for one of the pigs. They could only use the materials provided, and the house & pig had to survive the huffing and puffing of our big bad wolf (a blow dryer!). The students had so much fun and learned that challenging tasks require teamwork. We talked about their strategies and what made certain structures more stable. Great teamwork engineers! 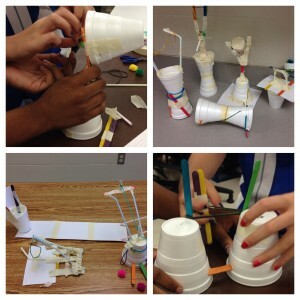 I encouraged the students to build and create at home. Some fun family suggestions would be to create a structure out of straws that could support a clementine or a tower of spaghetti noodles using marshmallows. 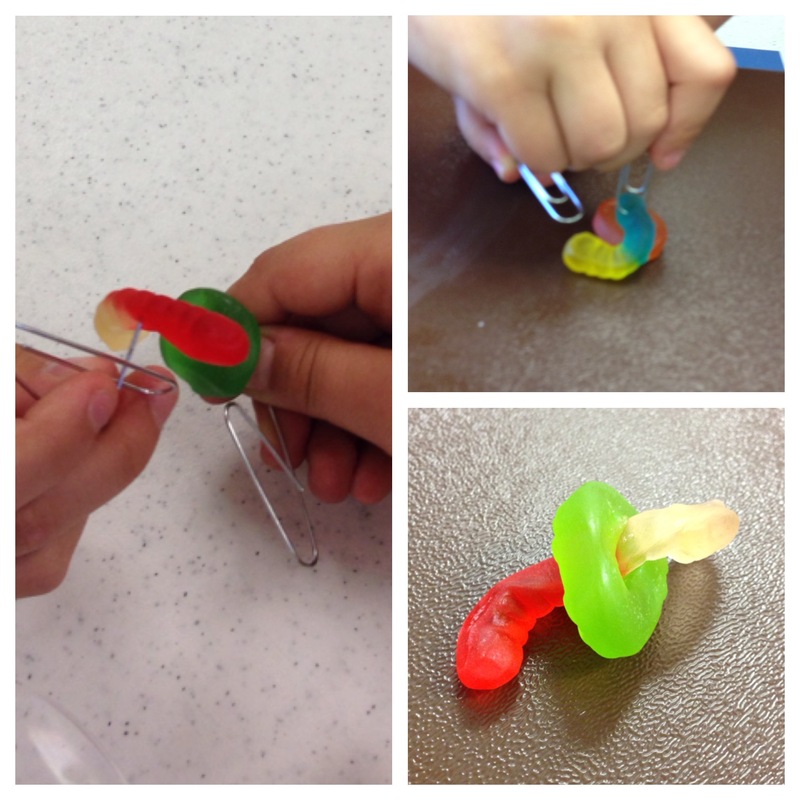 Grades 3 – 4 worked collaboratively to save our gummy worm, Sam. Poor Sam was enjoying a day of sailing when his boat capsized! The students worked in pairs to save Sam, by placing him through a gummy lifesaver. This may not seem challenging until you learn they were unable to use their hands. Each student was given 1 paperclip and the other hand had to be placed behind his/her back. As a team, the students had to collaborate, communicate, and problem-solve to save Sam in a certain amount of time. Grades 5 – 6 received an Engineering Mystery Bag Challenge. Inside a brown paper bag was a variety of materials: straws, craft sticks, string, rubber bands, cups, etc. In groups of three, the students worked together to complete the engineering task. The finished device had to launch a pom pom in the air as far as possible! Unfortunately not all classes had enough time to demonstrate their pom pom launchers, but their devices were displayed for the class to see. We discussed the engineering process and many groups realized the importance of brainstorming ideas before beginning the challenge. Great job, engineers! Next cycle each grade level will be beginning our first STEM unit of the year. Below is a quick list of the topics per grade level. Last week, your child visited the STEM classroom for the first time. This is a new class for every student at Blue Ball Elementary School. Our first class focused on introducing the units of study for the grade level, classroom expectations and procedures, and of course, explaining what STEM stands for: Science, Technology, Engineering and Math. I’m excited to be a part of the Blue Ball community and cannot wait to get started! STEM class will be a hands-on learning experience for your child. A lab where your child will be exploring science and engineering through investigations and problem-solving. I look forward to helping your child develop skills that will allow them to discover and change their world.